Butterballs, an egg-free cookie recipe, will melt in your mouth. Butterballs cookies include chopped pecans, toffee bits, and lemon pudding mix are a delicious trio in this cookie recipe. This egg-free cookie recipe,melts in your mouth, thanks to lemon instant pudding mix, pecans, toffee bits and powdered sugar. More cookie recipes at kitchenserf. Melt in your mouth cookies. These butterballs, which are both light and rich, thanks to the pudding mix and a roll in powdered sugar, which is also in the cookie dough. Note, let the cookies cool completely before rolling in powdered sugar. Otherwise, the warmth from the cookies totally melts the powdered sugar and you’re left with partially coated cookies. They’ll still taste good but they won’t have the lovely, powdery white appearance of one of my favorite childhood breakfasts, Hostess powdered sugar donuts, the miniatures. Did you ever have them? Chocolate came in second after those billowy confections. My friend got the recipe originally from a Taste of Home magazine but I tweaked it to amp up the lemon flavor. The original recipe just includes the lemon pudding mix. I added lemon extract, the juice of one lemon and lemon zest to amplify the sunshine flavor. I think it works. Lemon is the perfect flavor to match with pecan, don’t you think? Are you hosting a tea? These are great cookies for tea. They are small and can be eaten in just a bite or two. In the bowl of a stand mixer or a large bowl, cream butter and sugar together until light, about three minutes.. Beat in lemon pudding mix, water, lemon extract, lemon zest, lemon juice and salt. Slowly add flour and continue beating. Stir in pecans and toffee bits. Prepare baking sheet with either a piece of parchment paper or Silpat. so you may be able to fit 15 to 18 one baking sheet, depending on size. Bake at 350 for 15 minutes or until the bottoms are golden brown. 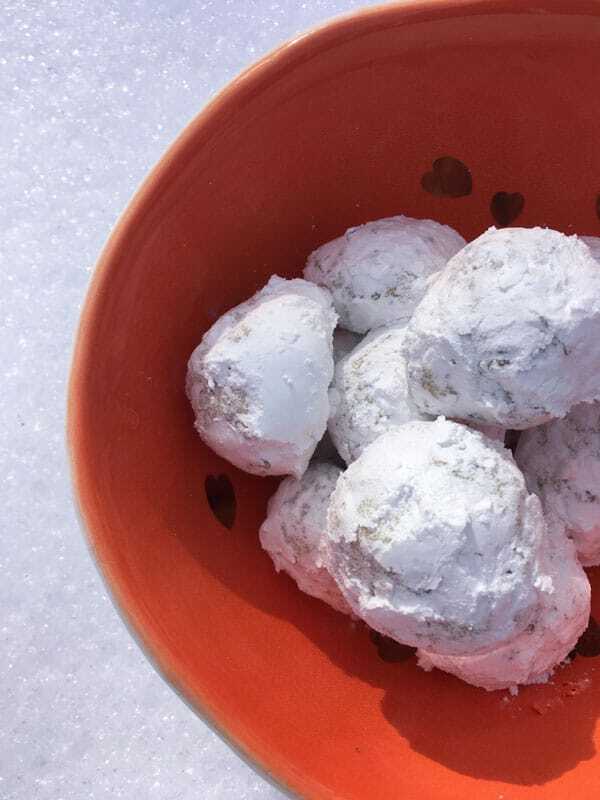 Let cool completely then roll in powdered sugar. Are you looking for more lemon cookies? What about an egg-free chocolate chip cookie?